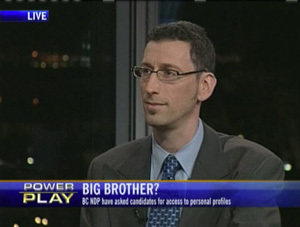 My handsome husband had his first live, national TV appearance, unexpectedly, yesterday. That guy is just unflappable. You can watch his clip here. Mark, you are so calm, cool and collected! What an awesome job!! You ROCK! I agree…great looking guy and smart too. 😉 Congrats Mark…this is just the beginning…when is he running for Office? Great interview, Mark !! I thought the interviewer was interrupting you a bit too much. But, as Andrea said, you were unflappable. The scene from “You’ve got mail” came to my mind. Tom Hanks watches the broadcast of his comments on TV (while in gym), and exclaims, “Who’s this smart guy ? !” 🙂 nnIt was also nice hearing your voice after so long.